Once upon a time, I saw a Pinterest board called Pinned it, did it. 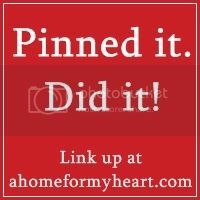 I had seen a lot of pins about how Pinterest was just a huge time waster and I thought the board was a brilliant way of recording the creativity and growth that pinner got out of her pins. So I made a Pinned it. Did it! board for myself. But sometimes I forget to go back and repin the pins I did to that special board. And what I really want to do is show off that I did something fun and neat that I found on Pinterest. Then I got this great idea to do a Pinned it. Did it! link-up. I've never hosted a link-up, but I've participated in a few. I think link-ups are a great way to share ideas and experiences around a common topic, and they make it easy to find all those ideas in one place! I'm a little nervous about this, and really excited. Please don't give up on me if my linky tool doesn't work right (I'm so worried I'll break it!). Just let me know so I can figure it out. P.S. I haven't even written my own Pinned it. Did it! post, but I had to get this up so I wouldn't put it off for another year. Now I have incentive to write up one of my pins asap! categories: Pinned it. Did it!